Kelston Park near Bath was the seat of Sir Caesar Hawkins. Its extensive gardens were landscaped by Lancelot 'Capability' Brown in 1767-68. 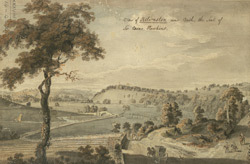 The mansion picture in the distance was built by John Wood the Younger around 1770. It was very plain in style but compensated by its imposing setting: perched on a wooded hill overlooking the Avon valley.